ST. LOUIS • Two 9-year-old boys proudly rolled a clattering 250-pound boiler into a schoolyard. Girls muscled little red wagons piled with waffle irons, toasters and dented pots. A second-grader dragged a ring of 921 keys. They were doing it for the big brothers overseas. Willie Stringfellow, 12, begged the principal at Cole School, 3935 Enright Avenue, to store his wagon overnight. “I’m going to be needing it again first thing in the morning,” Willie said. 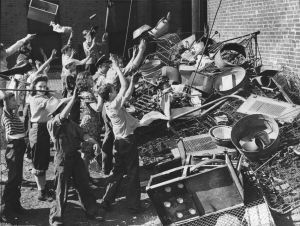 On Oct. 5, 1942, the first day of their drive, young people throughout the city and county hauled in 2,800 tons of scrap metal to feed industry during World War II. By Oct. 16, the end of the campaign, their total was 7,658 tons — the combined weight of 230 Sherman tanks. 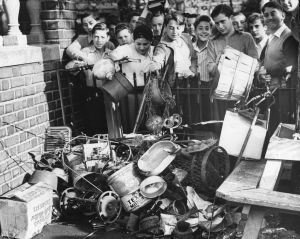 The army of nearly 150,000 local children enthusiastically joined a national campaign by the War Production Board to provide more scrap metal for the nation’s busy mills and foundries. 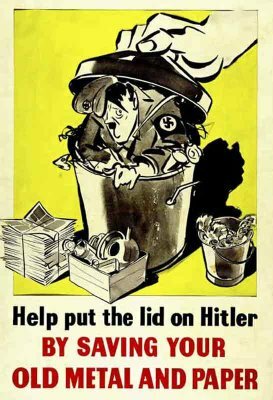 Junk was thrown into furnaces with new metals as a quick extender — it took less time to melt junk than refine raw ore, and America was in a frenzy of maximum war production. The effort began Sept. 27 with parades, promotions at the area’s 110 local movie houses and eager kids armed with address lists swarming neighborhoods in search of junk. Their slogan was “Get in the Scrap.” They promised residents they’d return soon for the goods. When the actual lifting began, children reported to their schoolyards with metal bed frames, branding irons, lawn mowers, corset stands, oscillating fans, iron sinks, sewing machines and wood-burning stoves. Collecting went on for two weeks, with updates reported daily by newspapers and radio stations. Joann Weber, 11, a student at Richmond Heights School, 7330 Glades Avenue, earned credit for donating a bulky steel safe from an old family business. Enterprising young scrappers with crowbars dug up abandoned streetcar rails. Farm kids threw in plow blades, hay rakes, fence posts, even a few old tractors. The junk went to scrap yards to be sorted and sent to the area’s seven steel mills and 45 foundries. Scrap yards paid the schools 11 cents per ton, most of that spent on Junior Red Cross programs. There were risks. Three boys were shaken up in the 5800 block of Pershing Avenue when they accidentally popped the pressurized ammonia gas in an abandoned refrigerator. Dorothy Lundak and Betty Noble, sixth-graders at Columbia School, 3120 St. Louis Avenue, were bitten by a dog while making a pickup. Acting city superintendent Philip Hickey had promised “no more school as usual” until victory was won, and the kids came through. Their effort provided 81 percent of the area’s scrap quota for three months. By war’s end, industrial production included 49,000 Shermans, 18,000 B-24 Liberator bombers, 4 million Garand rifles and 47 billion rounds of small-arms ammunition. If you had a wagon you brought it to school, to be used it to collect stuff. When it was full you pulled it to the school yard, emptied it, and hurried off for more precious cargo. Another war effort could be found in school. Every Friday, students would bring a dime or quarter if they had one and buy a U.S. saving bond stamp to put into stamp book. BOTH SIDES OF THE ECONOMIC DIVIDE–IS ANYBODY HOME?